With a new release in the works, I have just posted a preview video of song excerpts from the upcoming album titled, Dreams. The album contains several ambient and soundscape type pieces, along with some rock and electro pop. There are finishing touches to be made, but everything is coming along nicely, and I hope to have everything finished within a couple of weeks. I have some new music just released. 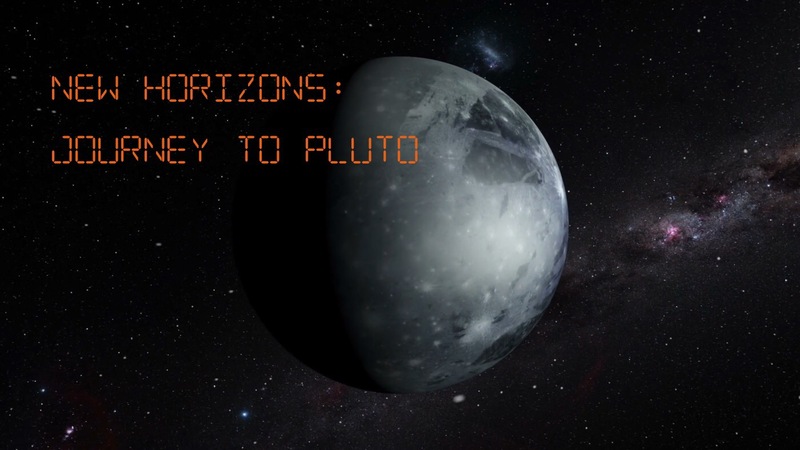 It’s a suite of four soundscapes created as an homage to the people who built, maintain and operate the NASA New Horizon spacecraft. As I state in comments on my Bandcamp page, this concept album started with one song, Caravan Of Spice, which I made last year (and was featured so kindly by Chip at iosmusicandyou.com). I had done some Wiki research on the anicent spice trade in conjunction with creating that song…and well…you now how one link leads to another. There is a lot more to the history of the ancient trade routes than many realize. Many more parts of the world were connected by various trade routes than I had imagined. The most famous of the routes is probably the Silk Road and I was surprised to learn of many others, such as the Amber Road, the Royal Road, and the Grand Trunk Road (not a band name). All of this information provided a great basis for inspiration and a place where I let my imagination run. Near the end of 2014 I had set a goal to release this album in February and hey, I almost got It here in March. A few life setbacks caused some time delays but nothing too bad. The real delay was the dreaded “last minute changes” that I had to implement. Once I had all of the pieces finished I listened to them back to back, as a whole story. Unsatisfied, I decided to reshape the album. I cut out some songs, and recorded some new instrument parts or changed some effects in other songs, but nothing too drastic. At the time that I reworked the Caravan songs, I had started to explore some very cool new music apps. 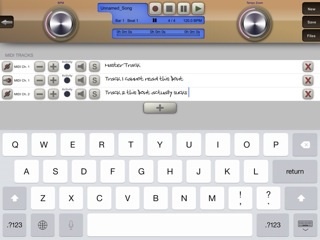 As it turns out; the song, Sahara, was made with one of those new apps: BeatHawk by UVI, and it was the final addition to the album (song number 3). And I have really started to like that app, a lot. The idea of a camel caravan dramatically traversing desert terrain is a romantic one in our western brains; the reality was quite different and often extremely harsh. I’ve attempted to express all of these various ideas and emotions through the works on the album. You just released an album and a music video…now what will you do? There is not enough enough time remaining in my life to accomplish everything that I can conceive — so setting priorities is the first order of business. I already know what is up next (most likely)…a music video of a song that I wrote last autumn. This will be a larger project; more detailed, more elaborate, and longer than any video I’ve done to date. No estimates for a completion date though. I had the utmost good fortune to attend a spectacular event on Saturday evening, October 11, 2014. 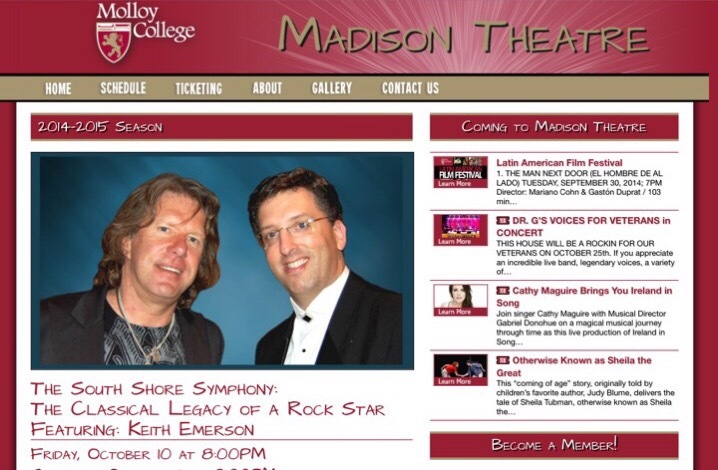 Billed as…Keith Emerson in Person: The Classical Legacy of a Rock Star. The South Shore Symphony of Long Island, NY (Scott Jackson Wiley, Music Director) provided a wonderful program that truly represented the Classical side of Mr. Emerson’s music career. It was Emerson, Lake and Palmer’s album Pictures at an Exhibition that introduced me to the super group and kick started my heavy interest in orchestral works as well. The original work by Mussorgsky was written for solo piano, but it is Ravel’s orchestration that we are more familiar with today. And prog-rockers are probably even more familiar with the ELP version. Pictures has become my all-time favorite large musical work, yet Saturday evening’s performance by the South Shore Symphony, was my first concert experience with the full work. It was delightful. And hearing it – seeing it – played live by an orchestra was just one of many delights that I encountered that evening. As a skeptical person I usually avoid talk of mystical and fantastic things and I don’t use certain words much but the word that I keep coming back to as I try and describe my experience: Magic. Very odd for me to write that, however it’s a word I use in an attempt to convey something that is so personal that using only words to describe just falls short. I think the musicians may have been a bit inspired by working with their guest of honor…who came on stage during the 3rd string quartet, waved at the crowd and then joined the 4 string players on the gorgeous Steinway big momma Grand Piano that dominated center stage. Glorieta Pass — Emerson conducting his on orchestral work. With the Steinway lid down in the closed position, Mr Emerson took up a position centre stage and faced the orchestra, (which revealed the sequined backside of his black evening jacket). With baton in hand he proceeded to conduct his work, Glorieta Pass. This was another piece that was familiar to my ears; the song Glorietta from Keith’s The Christmas Album and this orchestral work were based on work done for a soundtrack for a movie that was never made. I am glad it was not a throw away, it’s a beautiful, very moving piece (yes the spellings for Glorieta are different on album and in that evening’s programme). Jeffery Biegel is one of the preeminent pianists in the world today. With Emerson watching and listening in the wings, Jeffrey and the orchestra dove right into Emerson’s Piano Concerto No 1 — a piece that I fell in love with, way back when. This is from the ELP album Works Vol 1, recorded with a full orchestra but ELP performed it live that way only a few times — but you can hear on the ELP album — Works Live. This was a dream come true, and Mr. Beigel performance was magnificent. Keith ran out just before the maestro was ready to begin and shouted to the audience, with a bit of cockney, “We’re gonna give ya some Pictures at an Exhibition” a joke reference that most of the full house of 700 would understand, not so much for anyone else. Improvisations on Copland’s Fanfare for the Common Man, and jam session with Keith Emerson. The stage setup included a drum kit a dedicated bass player and featured several solos from various orchestra members. And not to be missed was the fact that yes indeed, a synthesizer made an appearance; some type of Korg keyboard sat atop the Steinway when it was rolled back on stage following “Pictures.” It produced the typical brassy synth lead sound for Fanfare that we have come to expect. It did sound really good too. Piano Solos — Keith Emerson. Keith at the piano with the orchestra and audience all around watching him perform. The selection included a most beautiful solo piece from the ELP album Black Moon called Close to Home. And then another item from my ultimate wish list; Keith Emerson played Tarkus – solo piano – live right in front of me. Oh my. In a night of gifts, and birthday celebrations, this was, for me, the most special of all. These two night’s were also billed as a celebration of Mr. Emerson’s 70th birthday (which is coming up November 2, I believe), and so with that, twice we sang a birthday song (once during the show and then again at the after show where Keith signed autographs, etc. It was really fun). Another highlight was when Mr. Emerson received an honorary plaque and something, maybe keys to the city? From the mayor or Rockville Center, NY — which took the guest of honor by surprise. It was an evening filled with humor, excellent music, and fond memories. My main takeaway was the inspiration I gained and my memory is filled with the overall warmth of the event — from the other fans like Scott, and Randy that I chatted with — to the general peaceful/artistic vibe that permitted the theatre. This was unique, special and truly one of the greatest events that I have ever experienced. And to think, if it was not for the much dreaded business travel that I endure, I would not have made this event. Austin, TX to Long Island, NY is a very long distance. I’ve got a new song and video up — for Halloween. Check the video page (link at top of page). 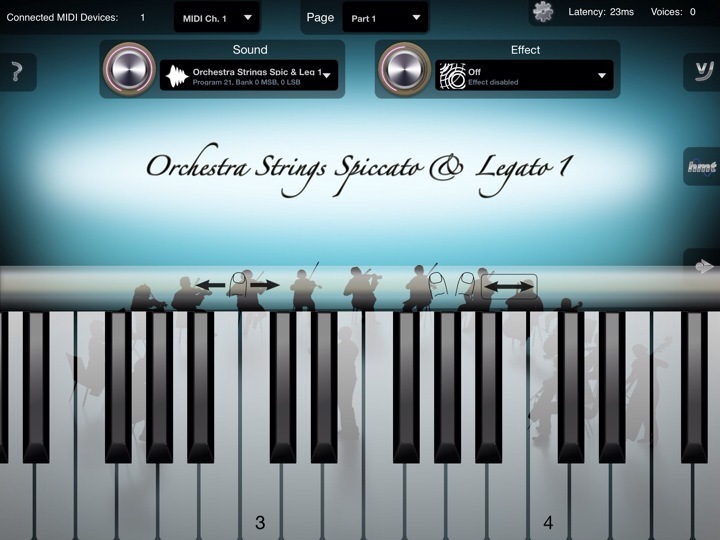 Another challenge: iSymphonic Orchestra app…why is it a challenge? Well if you glance down at the last few posts in this blog you shall see that I have a lot of new technology and tools for the making of music. I have a lot to learn in different areas of music tech, and I just added to that by acquiring this app. This could be the beginnings of my dream app. It’s still early in the life of iOS music and things advance rapidly, so I have a lot of hope now. So to begin, let me state that the sounds are superior to the other available iPad strings and orchestra apps. This is no Soundfont player, there’s a different technology under the hood, and the difference is quite remarkable. I can’t recreate what it sounds like to me on my monitors when the wav file is processed in iMovie and then uploaded to YouTube — I really have no idea how much fidelity we lose doing that, but it’s significant, I’m sure. I have created some short demo segments of the various instrument presets and some include cool EFX. I’m uploading the wave files to Soundcloud. I’ll post links here — (see bottom of this post for the links) but as I write this I want to get more example files posted. This will be higher quality, and I hope that one may be better able to judge the sounds via Soundcloud. 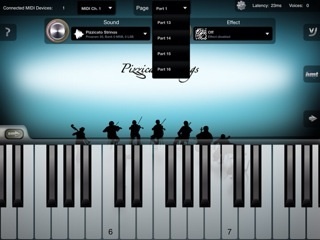 http://www.crudebyte.com — they also sell the CMP Grand Piano app, which is apparently the best sounding piano app available for iOS. I’ve heard some examples and I agree, though I don’t have that app. On the main page is the app’s tiny keyboard. Use two fingers to enlarge the keys (like zooming in on a map), and then tap the left arrow above the keys and swipe left or right on that line to change the note keys. Three functions can be accessed by icons on the right hand side. The arrow takes you to the recording and midi track page. Keep in mind this will record midi performance data, not audio. That’s why you need a host app like Auria. The recording is control by a standard enough looking transport control, but below that is a section that appears to have three timers, currently set to 0:00:00. It is probably some obvious thing that I don’t see…but I don’t see it…so…help! The next icon up labeled HMT gets us to the tuning page. Hermode Tuning has been described as pure tuning for that extra punch. This technology dynamically tunes (changes frequencies) in real-time. This usually has to do with tuning the 3rd and 5th intervals. I had to listen carefully but I did hear the difference in an example I found on youtube. Also I am no MIDI expert but there is a note tuning change MIDI message and I guess that gets incorporated within the app? If someone wanted to dive into that well…hey now it’s on the iPad! 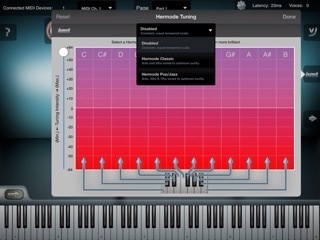 I should mention that Logic Pro, Cubase, Cakewalk and other similar PC software titles include this tuning technology. Pretty fascinating stuff, but that’s as far as I go with that. Back to the main screen…The icon that looks like a stylized V over J allows for adjustments in the key velocity. And this is something that I need to mess with and get straight…It seems overly sensitive for me but I have not explored this with any positive results yet. But I really need to, if you heard the first sound demo a lot of goofs are due to …well not this directly..it is my hands…but I think I’ll need to understand this so I can adjust for my playing. Once more Back to the main page: at the top are MIDI settings; it displays the number of connected midi devices, which seems like there is one more than I think there is, so maybe it’s counting the internal MIDI network stuff that sits in iOS? Another question here, with no answer from me. To the right of that is the input midi channel selector. From 1 thru 16. and next to that is the Page/part drop-down list, which seems like internal track numbers labeled part 1 thru Part 16. As I scrolled through the part numbers the instruments selection and MIDI channels would change so it has predefined parts….okay…and…..? The Questions are piling up. At the top right on the screen is a latency display and to its right is a counter for polyphony — the number of voices in use. Some of the complex programs use many voices per note and the iPad hardware will impose the limits, there is actual documentation covering this. Below that are the two knobs with drop-downs next to them. On the left is the volume knob, along with a dropdown list for selecting the program, (or sounds) from 1 to 10. And to the right of that are the available reverb and delay effects with a knob to adjust the effects send level; there are 18 EFX presets. There are a few problems that I ran into and hope then devs can get fixed. The main problem for me is that the default volume is set to maximum whenever the sounds are changed using the main voice change drop-down. Now, when I changed the part in the Page drop-down, and the voices changed, the volume remained at the same level, so there’s that. The MIDI sensitivity settings function — I am thinking that I don’t want to mess around with that for who knows how long before I get what it is. There are no instructions given so…oh well, I am sure I will figure it out eventually but the dev could give me some help here, ya know? The last thing is please, please Crudebyte, don’t force me to use iTunes file sharing to get MIDI files in and out of the app. Like most iOS music makers, I don’t want to mess with a PC connection…please allow the “open in…” function. Remember we are MOBILE and don’t tend to carry the PCs around with us. Otherwise, this is a brilliant sounding app and it will take some time to fully explore and understand the nuisances of the various sounds. 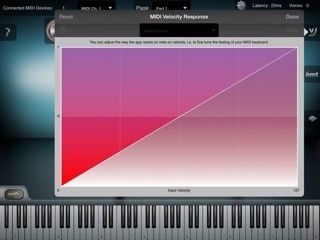 It seems like the tuning and sensitivity will be key items in mastering this app. 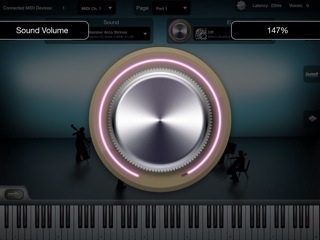 The users performance is more sensitive in this app than others that I have used and with the way the instruments are structured within each sound preset, how one approaches playing the sounds will be the key to successfully using this app. 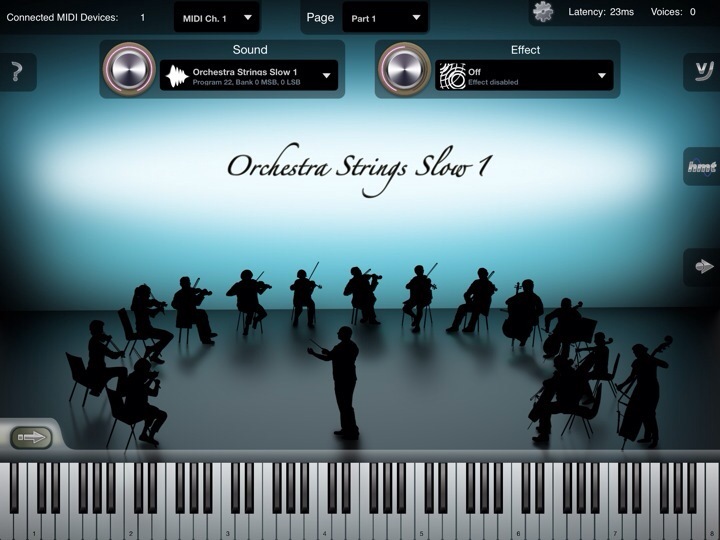 Orchestration is it own subject matter so a better understanding there will help immeasurably with this app. As for the high price — though set higher than the two biggies of iOS music, Auria and Cubasis, tis apple and oranges. It is so subjective but it will be worth the price for me because I have been writing/creating an orchestral piece, mostly using Music Studio; iSymphonic Orchestra will enhance my ability to interpret what is inside of me into what I am making with sound. As with all other enhancements that I use and have I’ve written about, my head is still on firmly and I know this is a tool that will help me do better things, but none of it means that I will make it better music. The effort is still in creating and executing; the tools are there to help — and man, are we getting some neat tools or what?